Row 7 founders Matthew Goldfarb (left), Michael Mazourek (center), and Dan Barber (right). Photo credit: Johnny Autry. 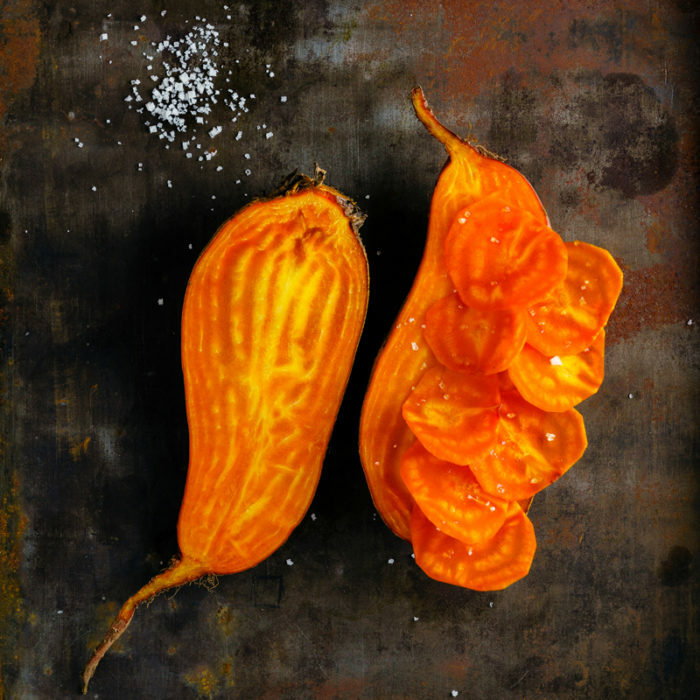 Chef Dan Barber loves heirloom produce. But, after cooking with it for years, the world-famous author and advocate for sustainable food says he realized that there was an important reason these delicate fruits and vegetables would probably never make it to the masses. “I was advocating for a system of agriculture that was untenable, for the 1 percent,” said Barber. Those relics of the past, he added, “just don’t perform well for the farmer.” Because they don’t have high yields, he adds, they’re not usually very profitable to grow, nor are they affordable to the average home cook. Today, Barber, chef at Blue Hill restaurants in New York City and upstate at Stone Barns, along with Cornell University plant breeder Michael Mazourek and upstate New York seed farmer Matthew Goldfarb, are launching Row 7 Seed Co., an attempt to overturn the conventional wisdom about seeds, food, and flavor. The seven different organic seeds the company rolls out today include a mild and sweet flame-colored beet, a heatless pepper with the flavors of a habanero, and a small potato with nutty, buttery qualities. They can all be grown nationwide, they all put flavor first, and they may offer a new path for farmers, chefs, and home cooks. Row 7 hopes to sell seeds that are easier to grow in farms and gardens, taste better and offer more nutrition, and are meant to increase seed diversity, accessibility, and affordability from the ground up. A basic rule of the company is that if it doesn’t thrive in both kitchen and field, or exhibit both deliciousness and scalability, it won’t make the cut. The company plans to release a second batch of seeds before the next growing season, if not sooner. These seeds will all be organically bred from inception to release—unlike most organic seeds, which are produced from conventional, chemical-intensive plants and later treated organically. This is important, explained Mazourek, because in order for a plant to interact with microbes, fight disease, and fix nitrogen to boost soil health in an organic growing environment, those abilities have to be “prioritized from the beginning.” What’s more, studies suggest that crops grown organically from seeds raised conventionally can have lower yields than crops grown from organic seeds. Row 7 seeds will also never be patented, says Goldfarb. If a seed is replaced by a newer version or discontinued, the new variety will be entered into the USDA’s National Germplasm Resources Laboratory, where it will be accessible to all. Another seed company can produce the variety, or a farmer or home gardener will be able to request the seed to produce more, he said. With the honeynut squash as a strong example—abetted by what Barber called the “tectonic shifts” that have caused more consumers to demand better-tasting, more nutritious, chemical-free foods—Row 7 has attracted a number of high-profile investors, including former CEOs of both Sysco Foods and Whole Foods. After several years of growing out vegetables and selecting seeds according to the priorities Barber and Mazourek had agreed to, Goldfarb said he realized there wasn’t a business behind their project that would support public breeding for flavor in a tangible monetary way. “We have lost seeds at an alarming rate over the last 100 years. Our cultural archive has been diminished.” His hope is to reverse that trend by using Row 7’s funding to support R&D for seed breeders—both public, land-grant universities and private breeders—around the country. Public land grant breeders are thrilled, said Goldfarb, to be breeding for deliciousness and nutrition once again. But they also need financial help in an era when public breeding programs are increasing and competing for a shrinking pool of available grant or foundation dollars. Row 7 has developed a licensing structure so that a percentage of the sales of seeds bred in public institutions goes back to help further the research. In many ways Row 7 is a work in progress, with many iterations ahead of it—much like the varieties it hopes to popularize and watch evolve. With a variety called the 7082 cucumber, for instance, the company hopes to bring back firmness and the subtle bitterness that has been bred out of most cucumbers in recent decades. For the 898 squash, a new take on the butternut, breeders went on a quest for more concentrated flavor, higher beta-carotene levels, and improved storability. “It’s a pathway versus an end,” explained Goldfarb.